The platform had not been restored an hour, before out of the blue, the Female that lives with the Doctor noticed an osprey circling high above . A single osprey high above the uprighted platform. No doubt about it. Confirmation. 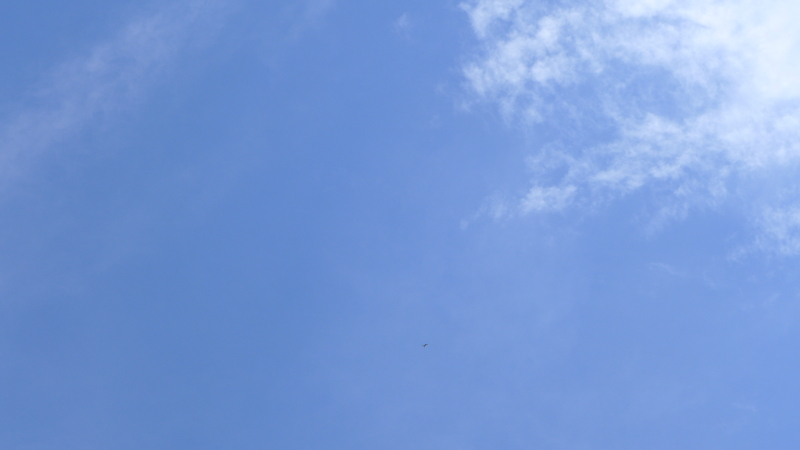 Definitely a single osprey soaring above the Doctor’s big nest. Is that a second bird too? Your guess is as good as mine. “Good eyes for a human”, said this mysterious narrator. “You are a doubting Thomas”, chided the Human Female that lives with the Doctor. To add fuel to the fire, she became the Devil’s Advocate for Tweedy’s certain survival. The Doctor’s gut feeling was the contrary, but he dare not hint of his misgivings. In deference to his better half he graciously bit his tongue. The Doctor took a home school, cram course on how to use his new Nikon D5200 digital camera, with all its fancy lenses, finished in fifteen minutes and settled himself at the back of his big nest to expect the unexpected. “Click”, went the Doctor’s Nikon D5200. 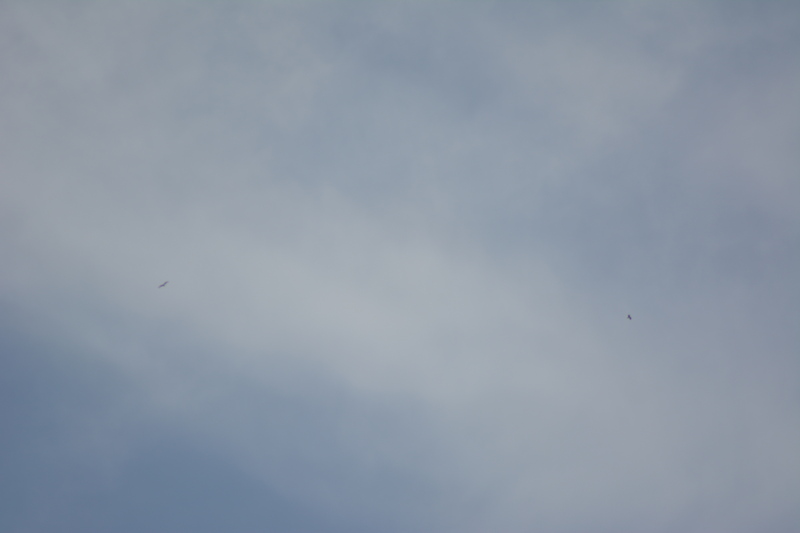 Two osprey soaring at high altitude. Without a doubt. No question about it. 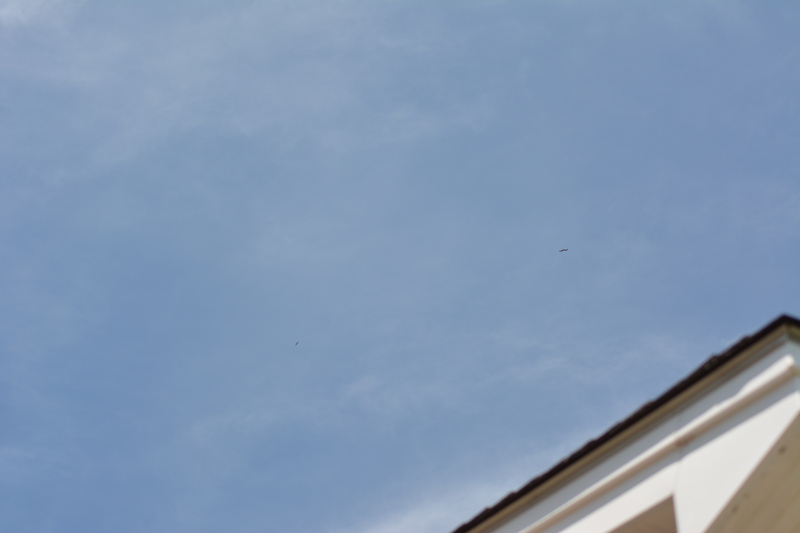 Two osprey high above their previous home. “Three osprey! 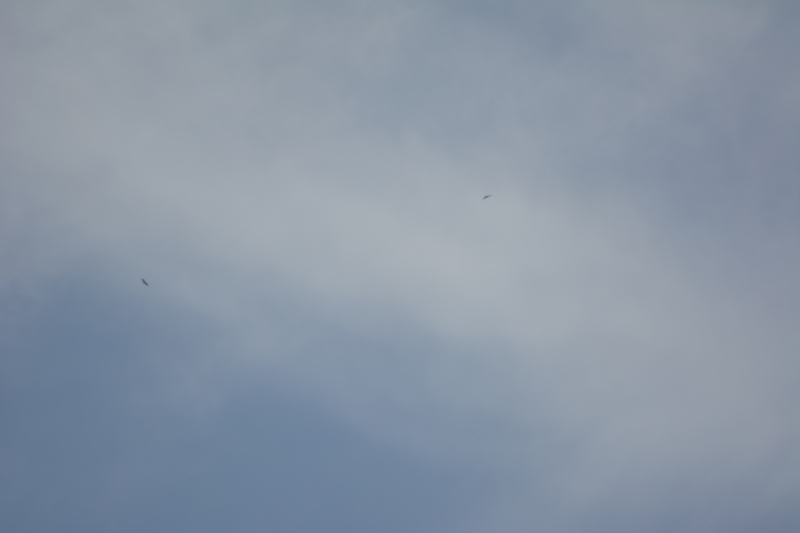 Three osprey”! blurted out the Doctor, as he sprang from the back porch, into the kitchen, tripping over the door jam, bouncing off the floor and landing on Marley who was sleeping peacefully under the kitchen counter. Arf! Arf! exclaimed Marley, expressing his sentiments in no uncertain terms. These observations may not have evoked such a response from the Doctor, if not for the fact that Ozzie was nonchalantly standing on the oyster rock not more than 200 yards away. The osprey friends ran out to see for themselves. 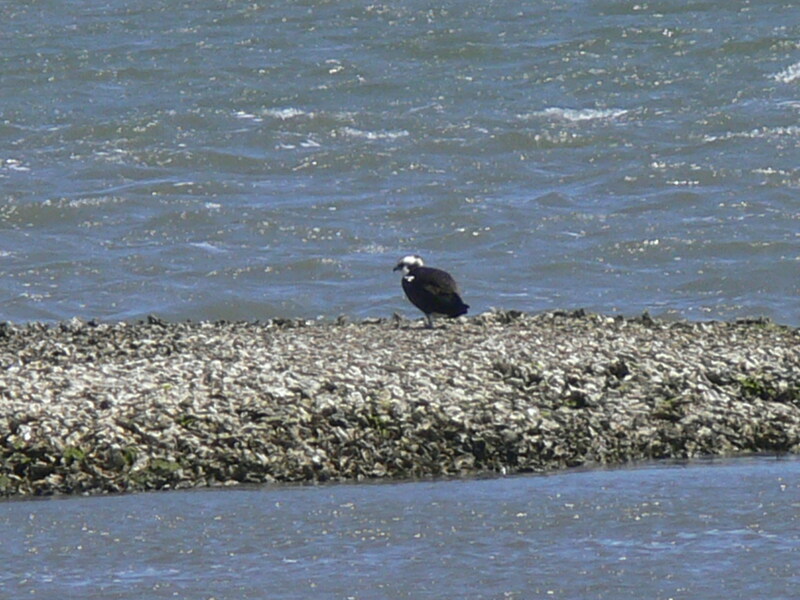 There are three ospreys in this photo. 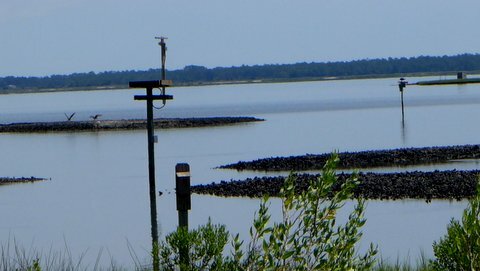 Harriett and Tweedy are on the oyster rock and Ozzie is on the marker at the far right., the Osprey Friends concluded. That is amazing!!! Glad they are back. It was amazing to be present for the whole thing. Very cool.